When I was a little girl I would love playing with my cousins down in South Carolina. Many of my aunts and uncles all lived along a dirt road just next to my grandparent’s farm and my cousins and I could run from house to house playing -like a little herd of chaos moving along on bare feet, making mud pies and playing tag. We’d get hungry and run to a random relative’s house (who of course wouldn’t let us in due to those bare, dirty feet and mud pies!) but they’d let us relax on the porch and if we were lucky bring out some fresh watermelon. Oh, the taste of sweet fresh watermelon…juice dripping down our chins as we gobbled it up and more than likely had contests to see who could spit their seeds the farthest! 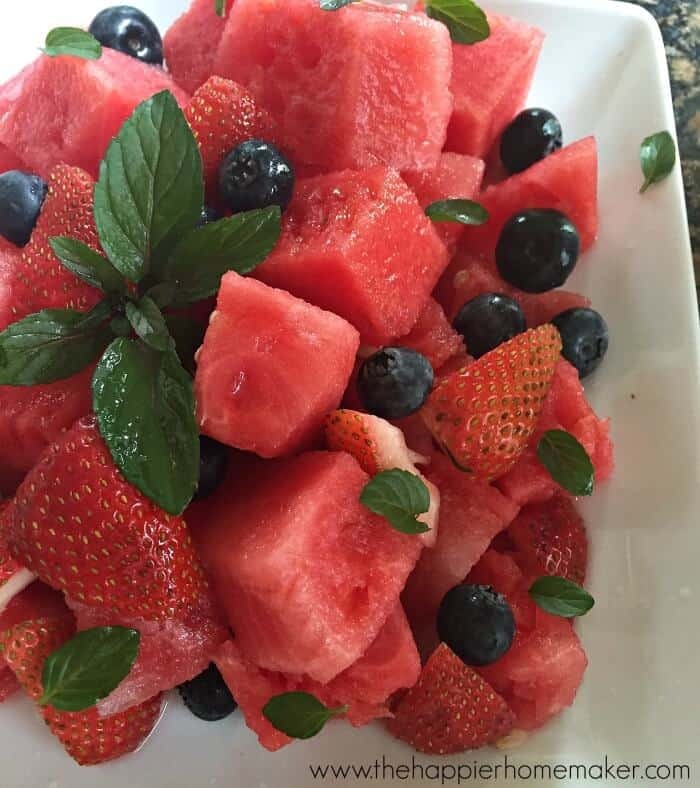 It’s one of my favorite childhood memories, so when I saw some watermelon making it’s first seasonal appearance at my grocery store last week I had to grab a few and whip up this amazingly delicious and simple Watermelon Mint Salad! 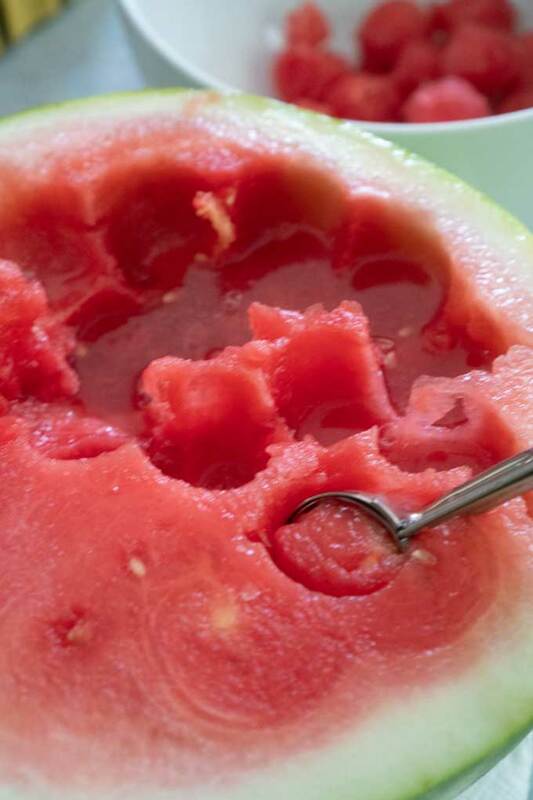 For one serving I used half of a personal seedless watermelon (have you seen these? This was the first time I had, they are so petite!) I also added blueberries and strawberries but you can add any of your favorite summer fruits! Simply chop the fruit and toss with finely chopped mint sprigs. Finally roll a lime around on the counter to release the juices and squeeze half over the fruit to give it a little kick-I promise, this is one of the most refreshing snack’s you’ll ever have! And it’s gorgeous so it’s one of those dishes that is perfect for potlucks! If you missed it on Monday-hop over and read more about how and why I’ve started eating clean (despite being a wine loving chocoholic!) and find more of my healthy recipes here! « 100+ Painted Projects & a Giveaway! previous post: 100+ Painted Projects & a Giveaway! This really sounds good. I think I will make it for the next get together with my husband’s family. It seems everyone always brings the same things. This would be something that everyone will love.